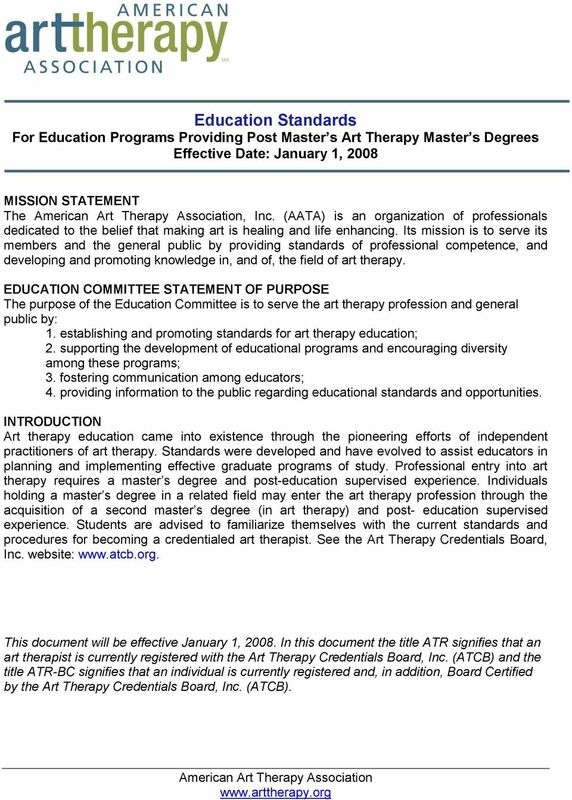 Download "Education Standards For Education Programs Providing Post Master s Art Therapy Master s Degrees Effective Date: January 1, 2008"
1 Education Standards For Education Programs Providing Post Master s Art Therapy Master s Degrees Effective Date: January 1, 2008 MISSION STATEMENT The, Inc. (AATA) is an organization of professionals dedicated to the belief that making art is healing and life enhancing. Its mission is to serve its members and the general public by providing standards of professional competence, and developing and promoting knowledge in, and of, the field of art therapy. EDUCATION COMMITTEE STATEMENT OF PURPOSE The purpose of the Education Committee is to serve the art therapy profession and general public by: 1. establishing and promoting standards for art therapy education; 2. supporting the development of educational programs and encouraging diversity among these programs; 3. fostering communication among educators; 4. providing information to the public regarding educational standards and opportunities. INTRODUCTION Art therapy education came into existence through the pioneering efforts of independent practitioners of art therapy. Standards were developed and have evolved to assist educators in planning and implementing effective graduate programs of study. Professional entry into art therapy requires a master s degree and post-education supervised experience. 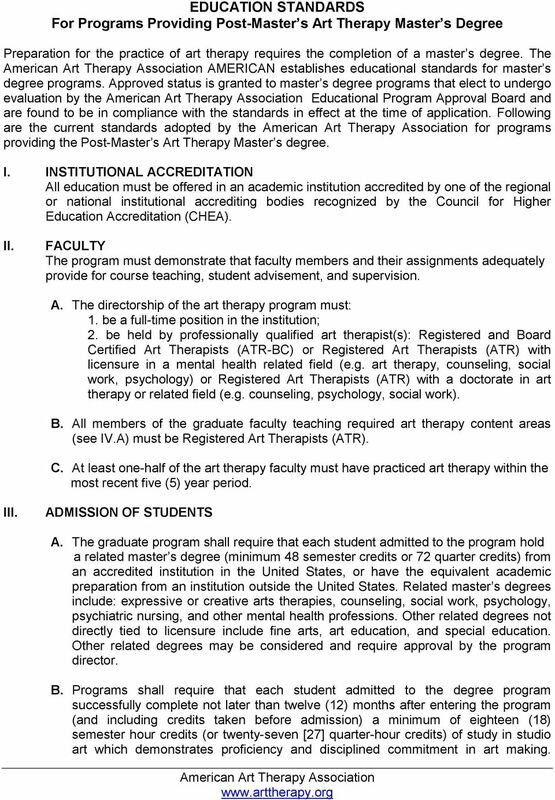 Individuals holding a master s degree in a related field may enter the art therapy profession through the acquisition of a second master s degree (in art therapy) and post- education supervised experience. Students are advised to familiarize themselves with the current standards and procedures for becoming a credentialed art therapist. See the Art Therapy Credentials Board, Inc. website: This document will be effective January 1, In this document the title ATR signifies that an art therapist is currently registered with the Art Therapy Credentials Board, Inc. (ATCB) and the title ATR-BC signifies that an individual is currently registered and, in addition, Board Certified by the Art Therapy Credentials Board, Inc. (ATCB). 2 EDUCATION STANDARDS For Programs Providing Post-Master s Art Therapy Master s Degree Preparation for the practice of art therapy requires the completion of a master s degree. The AMERICAN establishes educational standards for master s degree programs. Approved status is granted to master s degree programs that elect to undergo evaluation by the Educational Program Approval Board and are found to be in compliance with the standards in effect at the time of application. 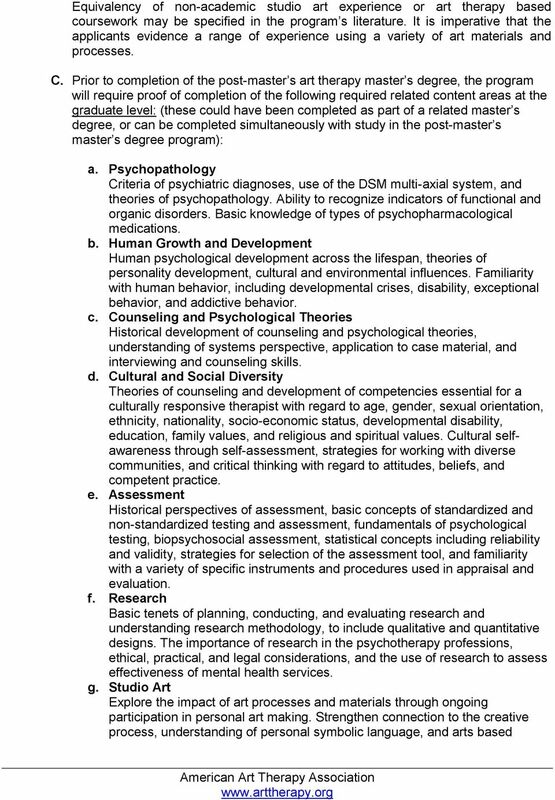 Following are the current standards adopted by the for programs providing the Post-Master s Art Therapy Master s degree. I. INSTITUTIONAL ACCREDITATION All education must be offered in an academic institution accredited by one of the regional or national institutional accrediting bodies recognized by the Council for Higher Education Accreditation (CHEA). II. FACULTY The program must demonstrate that faculty members and their assignments adequately provide for course teaching, student advisement, and supervision. A. 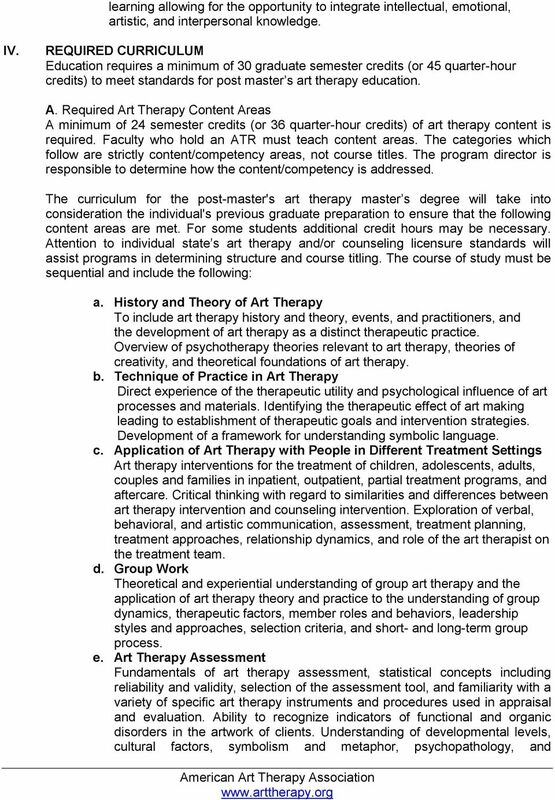 The directorship of the art therapy program must: 1. be a full-time position in the institution; 2. be held by professionally qualified art therapist(s): Registered and Board Certified Art Therapists (ATR-BC) or Registered Art Therapists (ATR) with licensure in a mental health related field (e.g. art therapy, counseling, social work, psychology) or Registered Art Therapists (ATR) with a doctorate in art therapy or related field (e.g. counseling, psychology, social work). B. 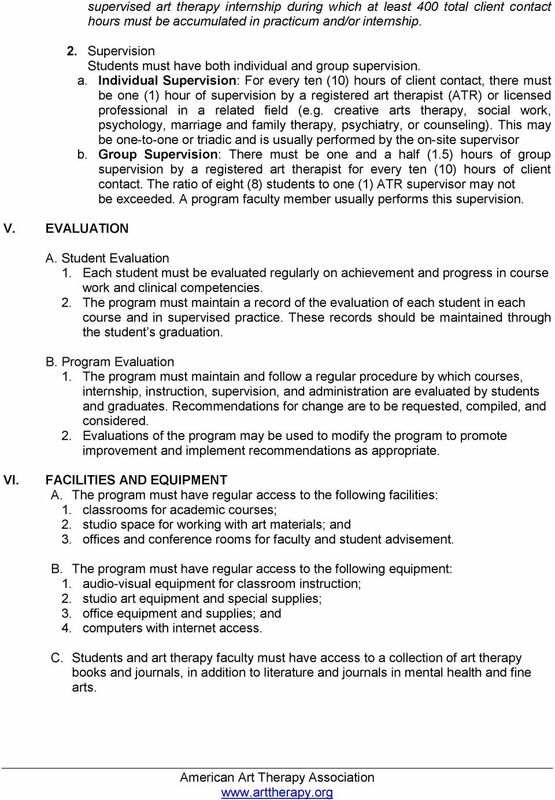 All members of the graduate faculty teaching required art therapy content areas (see IV.A) must be Registered Art Therapists (ATR). C. At least one-half of the art therapy faculty must have practiced art therapy within the most recent five (5) year period. III. ADMISSION OF STUDENTS A. The graduate program shall require that each student admitted to the program hold a related master s degree (minimum 48 semester credits or 72 quarter credits) from an accredited institution in the United States, or have the equivalent academic preparation from an institution outside the United States. Related master s degrees include: expressive or creative arts therapies, counseling, social work, psychology, psychiatric nursing, and other mental health professions. Other related degrees not directly tied to licensure include fine arts, art education, and special education. Other related degrees may be considered and require approval by the program director. B. Programs shall require that each student admitted to the degree program successfully complete not later than twelve (12) months after entering the program (and including credits taken before admission) a minimum of eighteen (18) semester hour credits (or twenty-seven  quarter-hour credits) of study in studio art which demonstrates proficiency and disciplined commitment in art making. 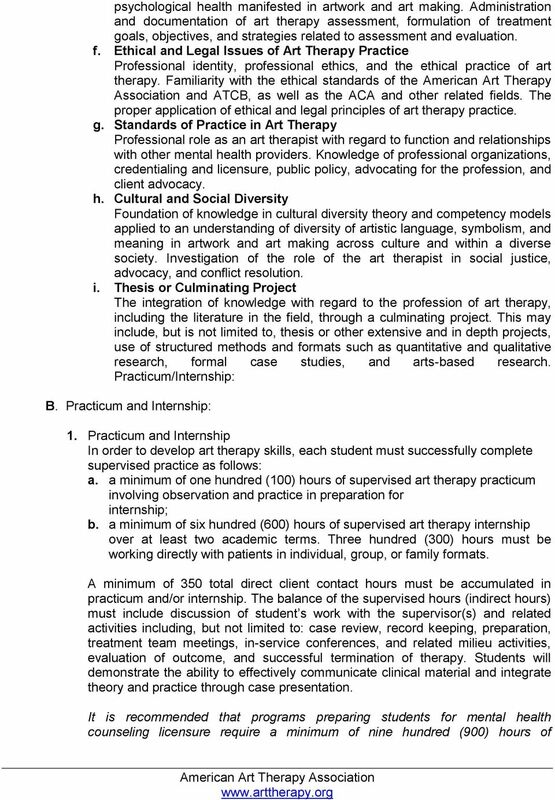 6 V. EVALUATION supervised art therapy internship during which at least 400 total client contact hours must be accumulated in practicum and/or internship. 2. Supervision Students must have both individual and group supervision. a. Individual Supervision: For every ten (10) hours of client contact, there must be one (1) hour of supervision by a registered art therapist (ATR) or licensed professional in a related field (e.g. creative arts therapy, social work, psychology, marriage and family therapy, psychiatry, or counseling). This may be one-to-one or triadic and is usually performed by the on-site supervisor b. Group Supervision: There must be one and a half (1.5) hours of group supervision by a registered art therapist for every ten (10) hours of client contact. The ratio of eight (8) students to one (1) ATR supervisor may not be exceeded. A program faculty member usually performs this supervision. A. Student Evaluation 1. Each student must be evaluated regularly on achievement and progress in course work and clinical competencies. 2. The program must maintain a record of the evaluation of each student in each course and in supervised practice. These records should be maintained through the student s graduation. B. Program Evaluation 1. The program must maintain and follow a regular procedure by which courses, internship, instruction, supervision, and administration are evaluated by students and graduates. Recommendations for change are to be requested, compiled, and considered. 2. Evaluations of the program may be used to modify the program to promote improvement and implement recommendations as appropriate. VI. FACILITIES AND EQUIPMENT A. The program must have regular access to the following facilities: 1. classrooms for academic courses; 2. studio space for working with art materials; and 3. offices and conference rooms for faculty and student advisement. B. The program must have regular access to the following equipment: 1. audio-visual equipment for classroom instruction; 2. studio art equipment and special supplies; 3. office equipment and supplies; and 4. computers with internet access. C. Students and art therapy faculty must have access to a collection of art therapy books and journals, in addition to literature and journals in mental health and fine arts. MASTER OF SCIENCE (MS) IN COUNSELING AND PSYCHOLOGICAL SERVICES I: Steps to becoming a licensed mental health counselor Apply to the program. Admissions information can be found at salemstate.edu/graduate.